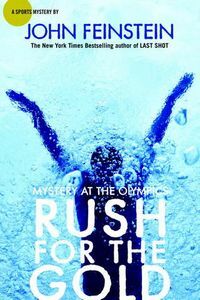 Rush for the Gold: Mystery at the Olympics by John Feinstein, a Mysterious Review. Review: Teenage journalists Stevie Thomas and Susan Carol Anderson typically cover the story; in Rush for the Gold: Mystery at the Olympics, the fifth entry in this series by John Feinstein for young adults, Susan Carol is part of the story. The London Olympics are just 5 months away — the trials just 15 weeks away — and Susan Carol is in contention to be a member of the US national swim team. But first she has to do well at the World Championships. Stevie, her unofficial boyfriend, is in Philadelphia covering her progress for the Washington Herald, and hopes to be able to travel to London to report on her in person … that is, if she makes it that far. She does, indeed, get to London, but quickly discovers being in the Olympics is not all about winning a medal. There are press events, sponsors, agents and more to keep a young athlete busy. And that's in addition to a little mystery on the side: is someone trying to fix the swimming event race results? Rush for the Gold is a little light on the mystery side, though that doesn't prevent it from being exciting. The first half of the book covers Susan Carol's qualifying events and as such is far more of a "sports" story than anything else. There is a lot of interesting insider information on what's involved to become an Olympian but not much in the way of sleuthing. As the subtitle of the book suggests, the mystery doesn't kick in until Susan Carol and Stevie reach London, she as a competitor, he as the "official" Susan Carol Anderson sports beat writer. A number of real-life personalities are featured and included in the goings-on, adding an element of authenticity to the plot. The storyline effortlessly flows between (mostly) Stevie's investigation of what he is beginning to think is suspicious activity and Susan Carol's continued training, though she has a part in poking around as well, all leading to a most thrilling conclusion. Rush for the Gold has a Lexile measure of 820L, and is appropriate for readers aged 14 and older. Acknowledgment: Random House provided an eARC of Rush for the Gold: Mystery at the Olympics for this review.